Today’s edition of the Tipp City (Ohio)Herald features a story on three-year-old Cami Gingrich, granddaughter of Pastor Forrest and Arlene Jackson of Dayton, Ohio. Many have been praying for little Cami, whose story was posted here last month. Here is a short excerpt from the story. To read the entire article, click here. can light up any room. Like most children, she is full of big dreams and aspirations. The bright eyed girl wants to play the piano, march in the high school band, and possibly become a doctor. According to Cami’s parents, Galen and Melody, she is not one to be left out or left behind. She likes to play, skip, and jump just like other children her age. You couldn’t tell from looking at Cami that she has a congenital heart defect. . .
. . . “We prayed for the doctors to be amazed,” said Galen. This first miracle came when it was decided that one of the surgeries would not be necessary. 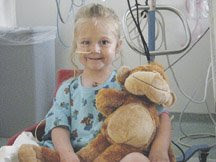 However, two surgeries were still necessary to help Cami’s body receive more oxygenated blood. The first surgery was performed in February 2005. The recovery process was slow and arduous. Cami’s appetite was poor and difficulties with her vocal chords made it hard for her to voice her discomfort. But the prayers of friends and family paid off again as Cami began to regain her voice and her strength. On June 9, Cami went in to have what her doctors hope will be the final surgery. The experience proved to be a challenge.